Wow, it seems like forever since I have done a wedding cake, or posted a tutorial for you guys here. Life is finally getting back to normal (whatever that is) after that Cake Off fiasco, LOL. 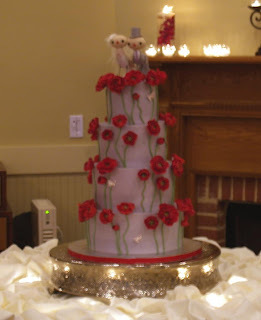 This past weekend I had a really fun and challenging wedding cake. Those of you that follow me on Facebook lived through some of the mishaps with me this last week. I had some bumps in the road, but luckily it all turned out fine in the end. 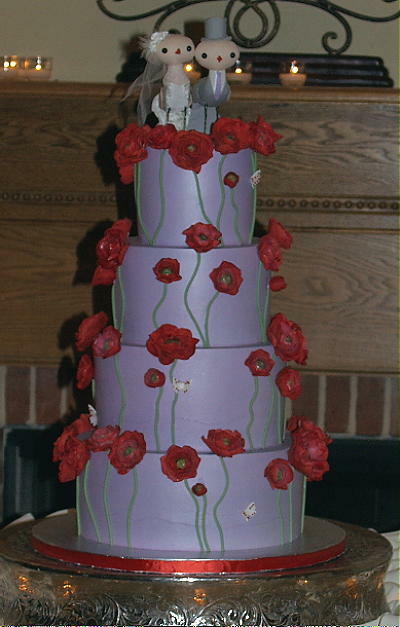 The bride wanted me to do a version of the cake found here. 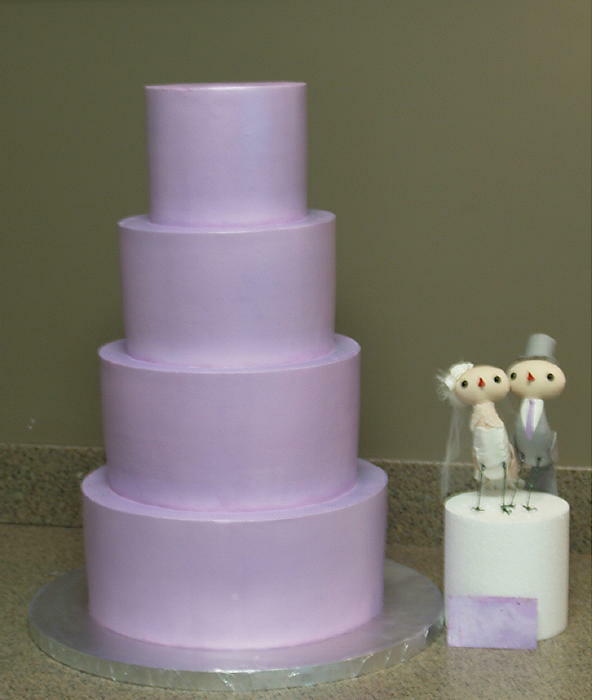 But she wanted 4 tiers, buttercream icing, and the lavender color instead of pale pink. (Actually the color swatch she gave me was called Grapesicle. Love that name.) Sure I said, no problemo! But I should have thought about the fact that lavender BC fades terribly, and I was going to be traveling with a tower of a cake over 70 minutes into the city over terrible, horrible roads. Doing this cake in fondant would have been much less stressful. But hey, I live for stress! I eat stress for breakfast! I believe the flowers are ranunculus, but most pictures I found have them pretty closed and you do not see much of the centers. 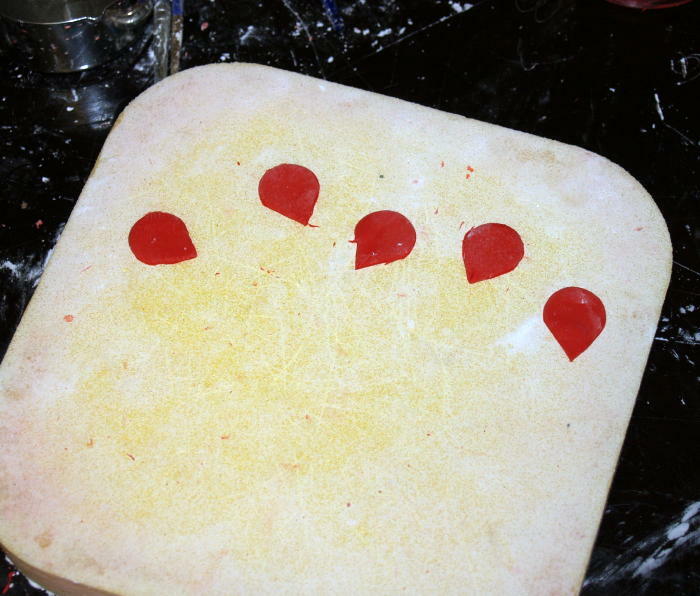 But the cake photo she provided had them very open, with the centers very prominent. So I did not worry so much if they looked like true ranunculus, as much as trying to get them to look as close to the flowers in the photo she provided as possible. 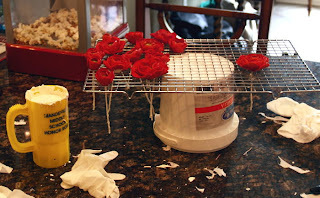 I did not find ranunculus cutters anywhere, so my dear friend Rebbecca Sutterby shared her method with me of using rose cutters. I spent the better part of two days trying different centers and petal formations. I struggled to get the overall shape and petal movement right. When my son told me that the centers looked like giant olives, I knew it was time to call in reinforcements. The big guns. The Wendy. The Wendy came over in a flash and looked at them with a fresh eye. In fact, she said my centers looked like eyeballs. Olives. Eyeballs. Oliballs. Whatever you call them, they were wrong. And way too huge. So Wendy and I played with centers and petals until we got a formation we were happy with . Start by putting a ball of green gumpaste onto the end of a wire. The size of the ball depends upon how big you want to go with the flowers. We made a variety of sizes, because we wanted a variety of flowers in different stages of bloom on the cake. 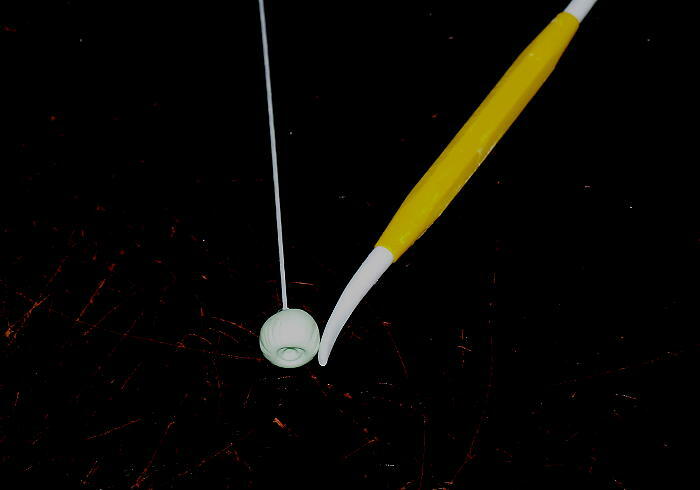 Next you make an indentation on the end of the ball with the flat side of an exacto knife. Then make a little hole inside that circle with the pointy tip of a small paintbrush. ( I forgot to photograph those two steps, my bad.) 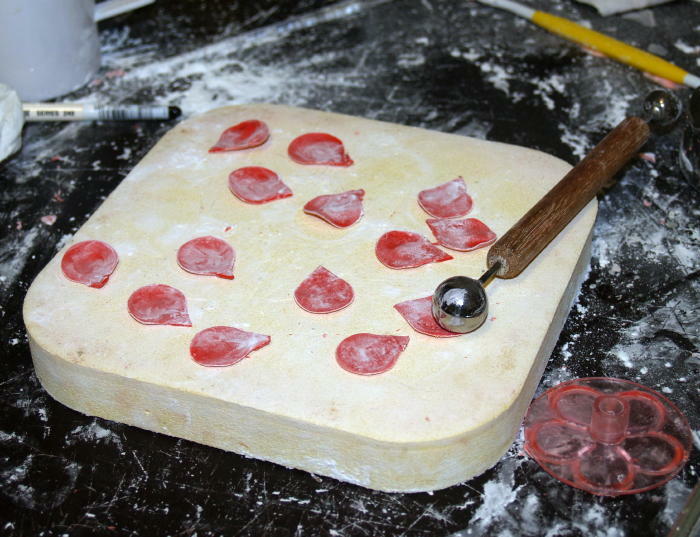 Then score the sides all around the ball with a veining or dresden tool to make the lines. Here is a whole bunch of centers that Wendy rolled for me. You can see the indentations in the centers. Here you see one that I had dusted with green dust. I used a combo of chartreuse and a lime green dusts. Just play with whatever colors you have till you find a look that you like. Here are some dusted centers. The 2 dark ones were rejects. I tried a darker dust and that was a no go. 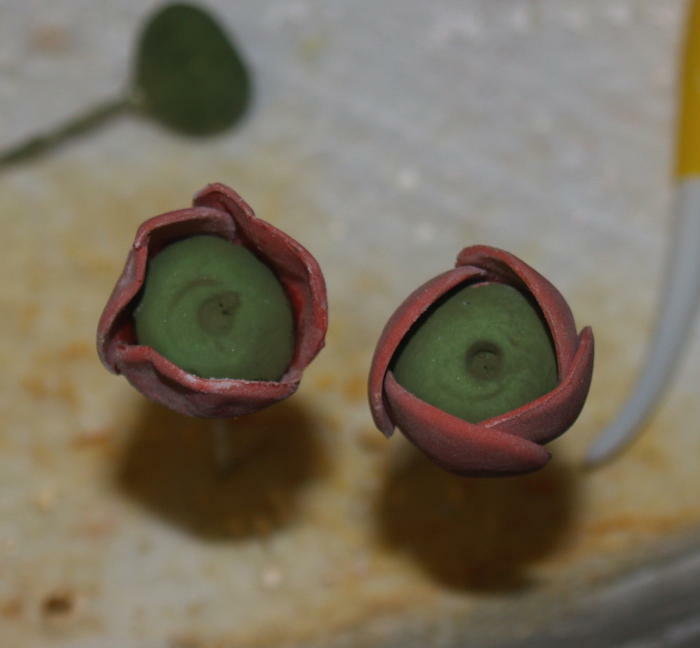 Now time to add the petals. 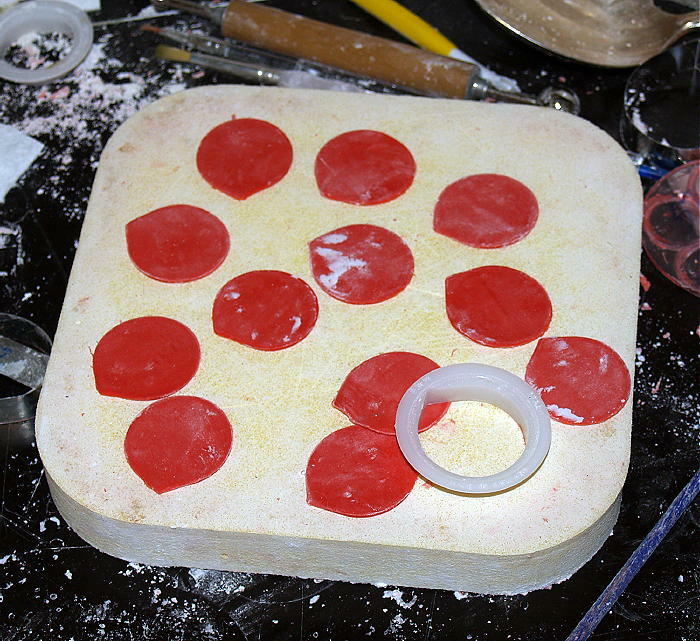 I colored my Wilton premade gumpaste (love that stuff) with super red gel color. I rolled it out to number 5 on the pasta roller and used the JEM all in one rose cutter to cut out the petals. 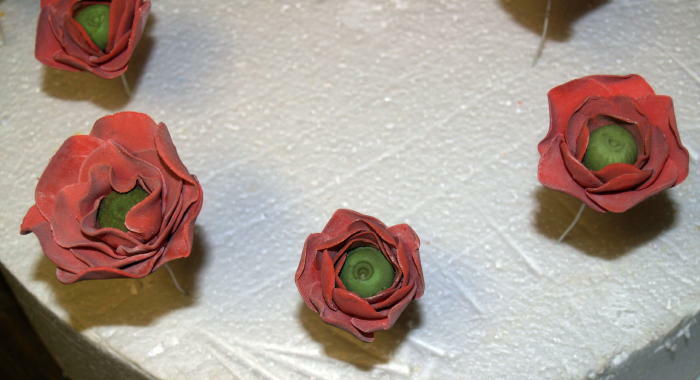 I used the 50mm size for the first 2 rows of petals. Use the large ball in the center of the petal only to make it cup shaped, and let them dry out for about 5 minutes. Then you can attach 3 or 4 around the centers. I did one here in a more closed, tight wrap, and one more open and frilly. I did not want all of the flowers to look exactly the same. If you vary them up a bit, and shape some of the petals differently, you will get a much more realistic look on your finished cake. Then I cut out more of the same sized petals. 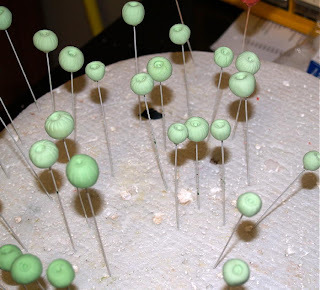 This time I used the ball tool to thin them out along the edges, but did not press so hard and to make them very ruffly. Yet. 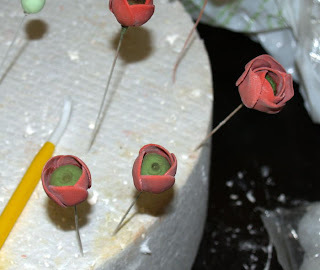 Make the very outer petals more ruffly. Yes, I use a lot of cornstarch. I love cornstarch. Do not fear the cornstarch, for it is your friend. 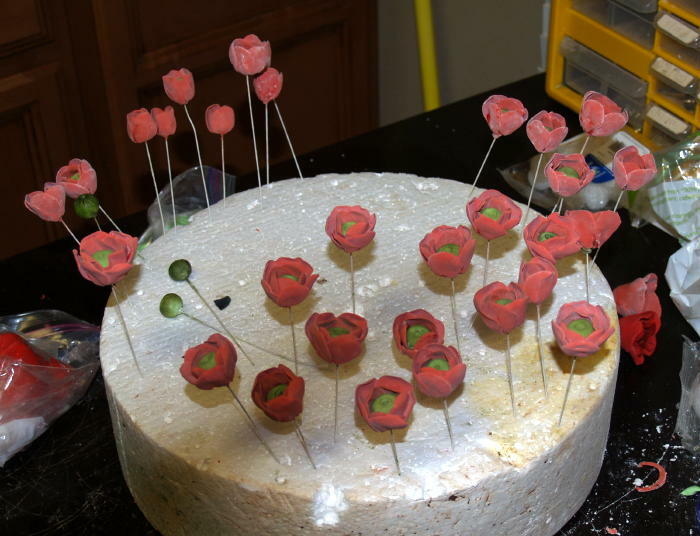 Here is one flower with the second row of petals in place. I used 5 petals for the second row. Notice that this bud has 4 petals in the inner row. There are no set rules with this flower. 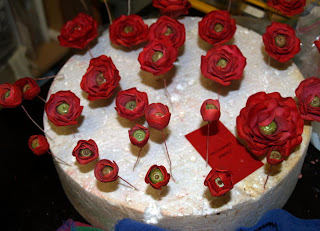 Vary the number or petals and configurations throughout the flowers. 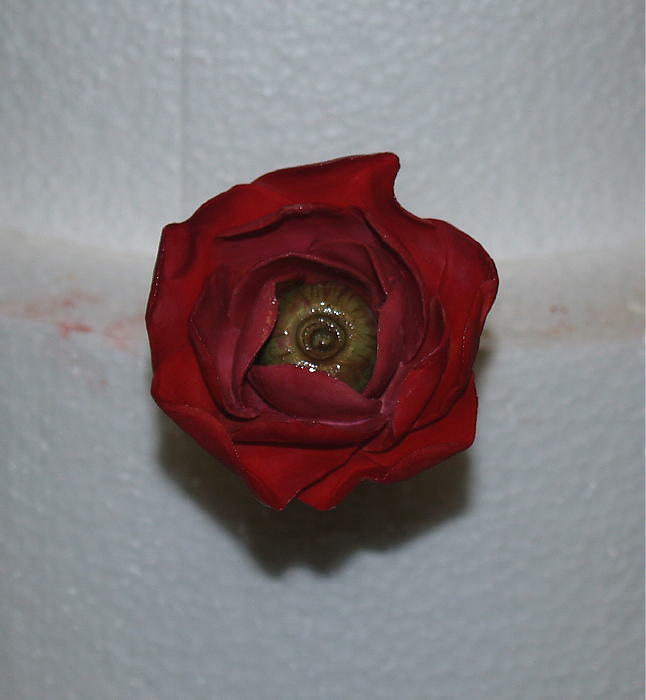 Notice how the tips of the petals bend in toward the center. 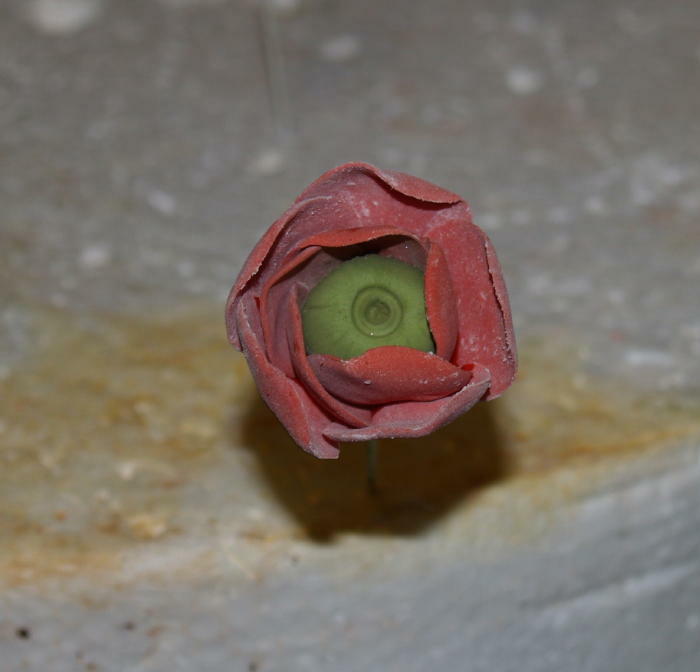 That is a distinct characteristic of the ranunculus. 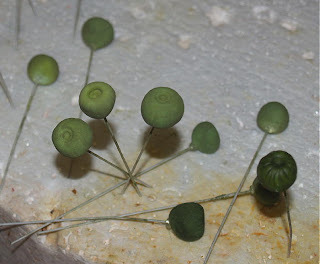 Originally I kept pinching mine in the other direction, and was wondering why they all looked like roses! Inward, not outward! A couple of buds an another with a 2nd row in place. Then the outermost petals were done with a larger single rose petal cutter. This set is an FMM rose cutter set. You can just make it work with whatever cutters you have. 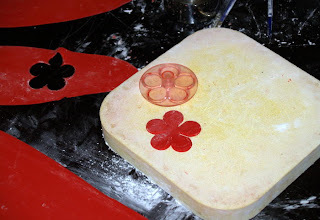 I used 6 or 7 petals for the outer rows. It is not an exact science. In fact, I was winging this all the way through! 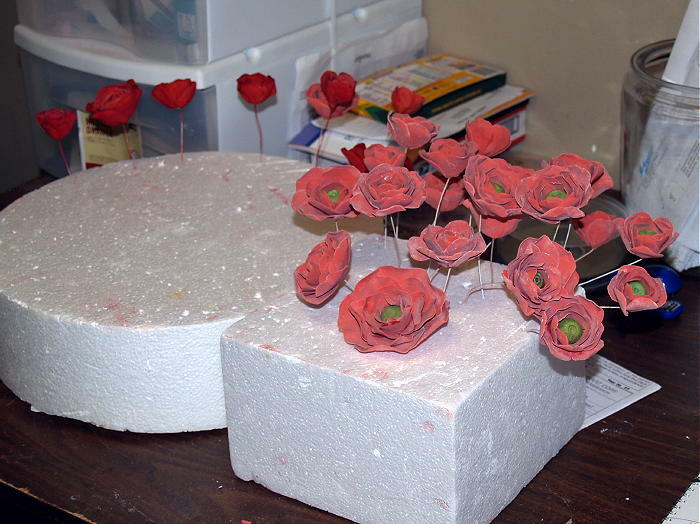 Here are some flowers in varying stages, some tighter and more clustered, some with less rows and more open and loose. 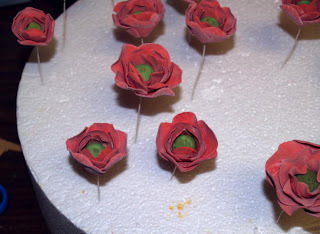 Here are some drying upside down so the petals do not fall off. You wet the end of the petals, hold your flower upside down, and apply the petals in an overlapping fashion till you make it all the way around the flower. 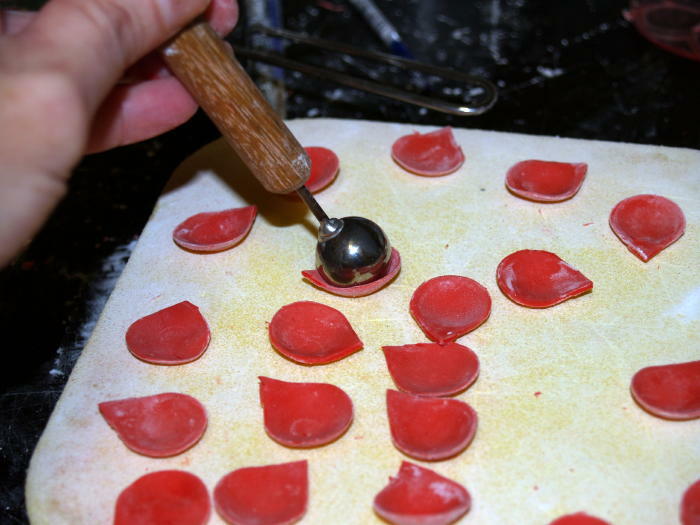 Tweak and bend the ends of the petals with your fingers, and then hang it upside down to dry for a while till it is good and set. You have to do this after every row or all the stuff will just slide right off the flower. Don't you like my fancy drying rack? No expense is spared in this operation, I tell you! After they are able to hold their own shape, I stick them in styro to finish drying fully, overnight. More drying.... they were everywhere! 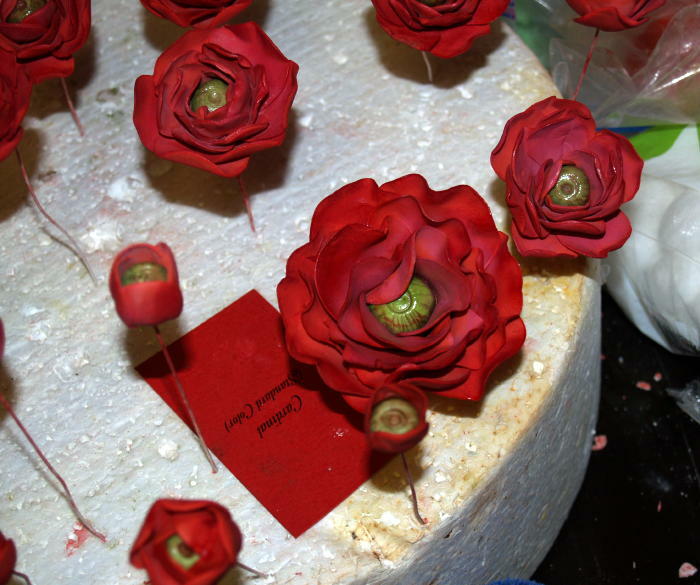 Invasion of the gumpaste ranunculus! All dusted! See how well they matched the color swatch she gave me? Score! Love it when that happens! This was my favorite flower out of all 60 of them. WAIT! I am so embarrassed by how funky that dummy is! I promise you it was washed and clean, just stained. But seriously, I think I need to spring for a new dummy. Sheesh. 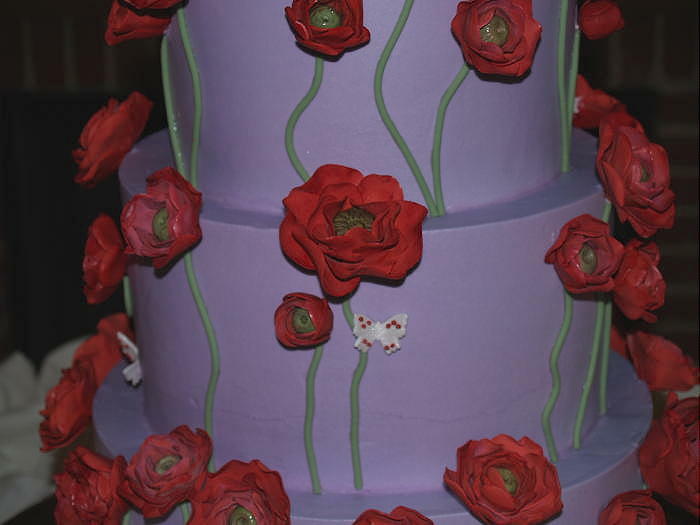 Now how in the world are we going to get 60 flowers to stay on a BC cake? Welcome to my dipping station. I left the wires on the flowers nice and long. 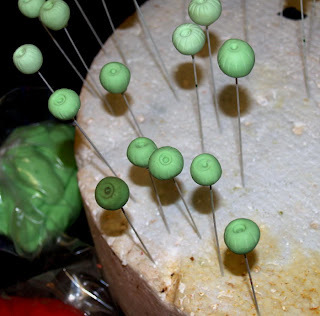 But we know we can't stick nasty wires into the cake, so I coated them in white chocolate. 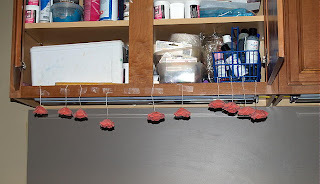 I filled a tall cup with melted chocolate, dipped the wires in, shook off the excess, then threaded them down into the cooling rack to dry fully. When it came time to arrange them on the cake, I just stuck them right in, and they went so far into the cake, they held up beautifully. I did not even need any melted chocolate to glue the flowers onto the sides. Which made things much easier and cleaner for the cake server. Naked as a jay bird, LOL. Here is the cake all iced. Next to it you see the color swatch the bride gave me to match, and her topper. 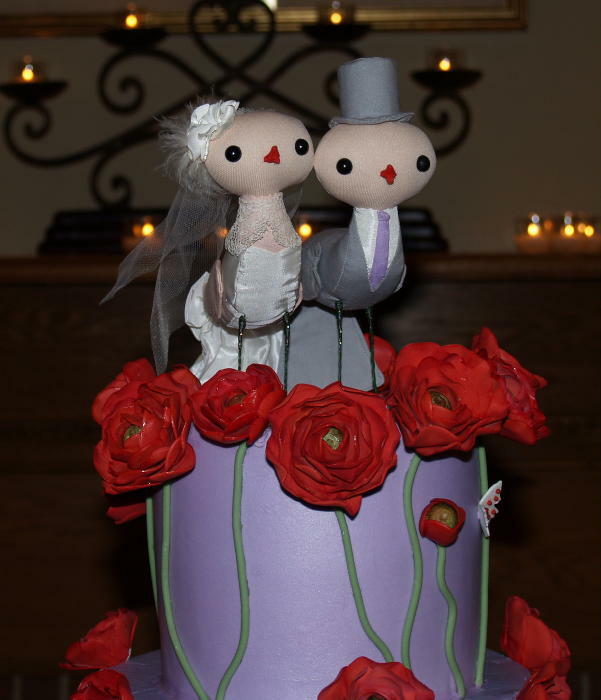 I wanted to make sure the cake, the swatch, and the groom bird's tie all matched. To get this color I used regal purple, violet and a touch of pink. 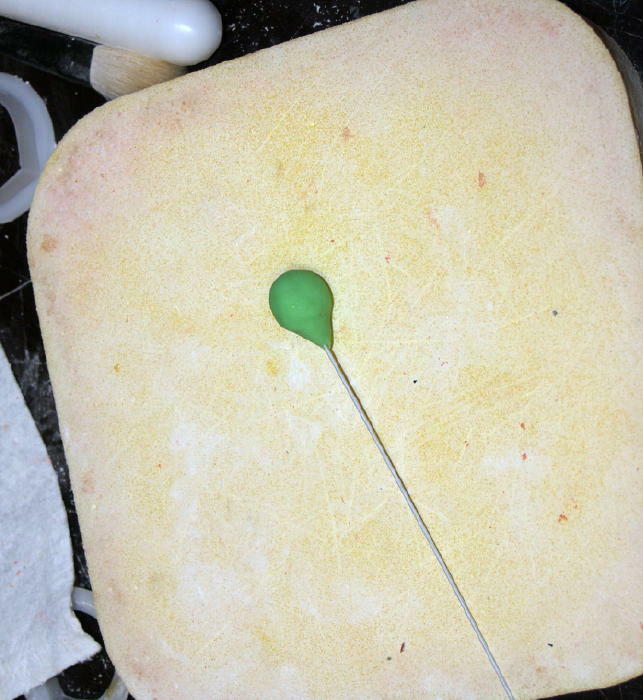 I got a beautiful match, but within 2 hours of icing a dummy cake, it turned horribly pink. I added some more purple to the batch. Same thing happened again, but it was also too dark. So I made equal batches of white BC, and combined them. Now I had the perfect shade, but it changed to pink again! My friend Heather realized that the lavender in the icing was fading out (as purples notoriously do), leaving the pink to be predominant. I was a bit panicked at this point; I could not set up a pepto bismol puky pink cake! Well Adele came to my rescue and gave me the brilliant idea of airbrushing the whole cake with lavender airbrush sheen. It worked! It stayed! It did not fade! Thank God for cake friends who save our butts! So we load the cake up and head out on the long treacherous ride to the venue. New Orleans has notoriously bad streets. So bad in fact, I thought I had sworn off taking cake orders for the city. Obviosuly I forgot I did that, cuz I took this one. Well, the dear beloved husband drove way too fast for my liking, despite my pleas for him to slow down. I was very nervous the whole way cuz we were hitting some rough stuff. Well low and behold, when we got there and opened the back of the vehicle, my poor cake was battered. It had surface cracks all over the sides, and my beautiful borderless seems had all cracked open. I refrained from bleeping the hubby out, and just proceeded to do my thing. We got it inside, I repaired all the borders, and placed the flowers on. Oh so luckily, once they dimmed the venue lights, the cracks were barely visible at all. I lucked out on that one! Here it is at the venue. 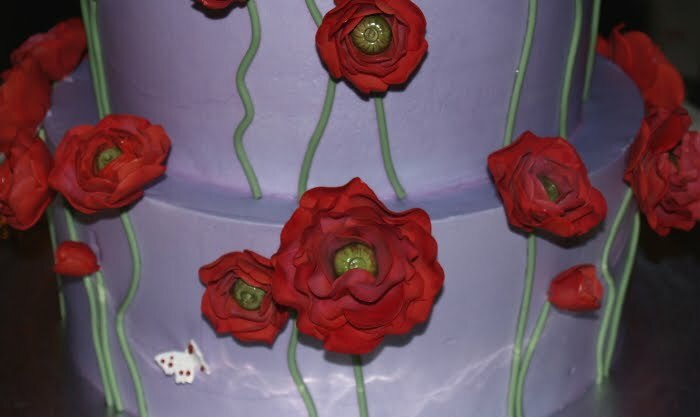 The photo is dark and out of focus, but this one portrays the color of the icing more accurately than the one at the beginning of this post. I love how they dressed the cake table too, very elegant. And that is the story of the Grapesicle Red Rannancuclus Cake. Tutorial and photography by Sharon Zambito- copyright 2010.